Primary teeth start to erupt in children from the age of six months. The primary dentition is complete by approximately two and a half years of age. The enamel of primary teeth is less densely mineralized than the enamel of permanent teeth, making them particularly susceptible to caries. Primary teeth are essential tools, both for chewing and learning to talk. They help to break up food into small pieces, thereby ensuring efficient digestion. A full set of teeth is an essential prerequisite in learning correct pronunciation. Primary teeth also play a vital role in the proper alignment and spacing of permanent teeth; it is therefore imperative that they are well cared for and preserved until normal ex-foliation takes place. Establishing a proper oral care routine early on in life sets the foundation for the development of healthy and strong permanent teeth. In addition to good oral hygiene, diet also plays a key role in keeping teeth healthy. In this respect it is not only the quantity of sugar that is important, but also the frequency of consumption. As much as possible, children should be limited in the amount of sweets between meals, especially in the evening or at night. Although permanent teeth are already partly formed in children aged 0 to 3 years, eruption only occurs later in life (from about 6 years on) when the 32 permanent teeth (16 in the upper and 16 in the lower jaw) replace the 20 primary teeth. During this time root resorption and crown shedding of primary teeth take place. With the eruption of the first permanent teeth (from about 6 years on), the mouth contains a mixture of both primary and permanent teeth, which puts children at increased risk of caries. Often the eruption of this permanent tooth is not realized neither by the child nor by the parents, because it is positioned behind the last primary molar and is not replacing any primary tooth. Although enamel is fully formed at eruption the surface remains porous and is inadequately mineralized. Subsequently, a secondary mineralization occurs (second maturation), in which ions from the oral cavity penetrate hydroxyapatite and increase the resistance of the enamel against caries. Furthermore, any primary teeth with caries form reservoirs of bacteria, which can easily attack the immature enamel of the new permanent teeth. During the eruption, the occlusal surfaces of the new permanent teeth are on a lower level than the primary teeth. Toothbrushing becomes more difficult than before, given the coexistence of loose primary teeth, gaps and newly erupting permanent teeth. The jaw is also growing significantly, making space for more teeth. The cleaning of the narrower interdental spaces becomes more important with increasing numbers of permanent teeth. Parents have a key role in helping their children to develop a proper oral hygiene routine in the first years of their life. Parents should lead and supervise their children’s toothbrushing approximately for the first 12 years, until motor and mental functions allow the child to routinely perform a proper toothbrushing technique alone. 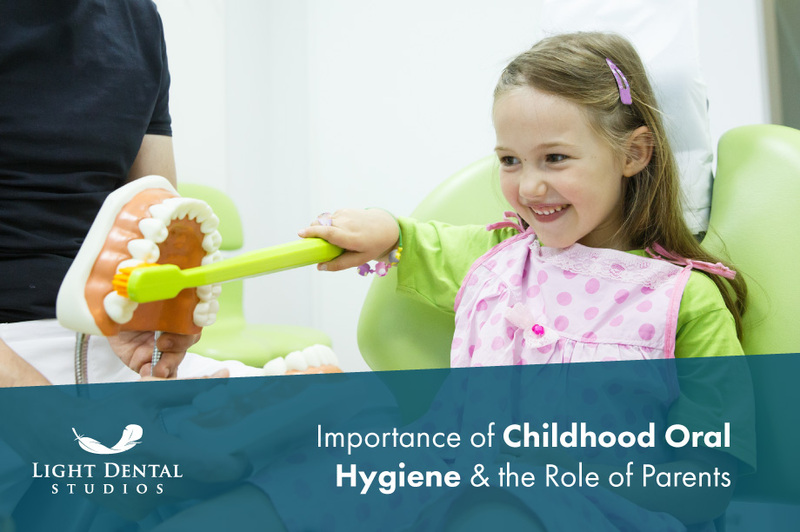 After brushing the teeth for their children for the first 2 years of life, parents will have to use playful motivation to encourage their children to brush their own teeth from about 3 years onwards – the time when children want to brush their teeth alone. Each time the child has finished brushing, parents should re-brush the hard-to-clean areas. At the age of around 6 years, children are able to brush their teeth using a proper brushing technique. In this phase, parents have to continue supervising the regular brushing efforts of their children. The special anatomical situation of changing dentition makes it indispensable that parents still need to help their children in the daily toothbrushing task until eruption of the second molar (around the age of 12). As soon as the first primary teeth erupt into the oral cavity, parents should begin brushing their children’s teeth. From the age of two years, teeth should be brushed twice daily with smaller than a pea-size amount of children’s toothpaste. Small children tend to swallow a large amount of toothpaste, so that there is a risk of developing dental fluorosis. Supervised application of the amount of toothpaste to the toothbrush is important. Due to the risk of fluorosis, the fluoride content of toothpaste for children up to the age of 5–7 years was reduced in most European countries (250 ppm to 750 ppm). Beginning with the eruption of the new permanent teeth, children should be switched from a low fluoride containing children’s toothpaste to a higher fluoride containing toothpaste (1000 ppm to 1500 ppm). This ensures the best caries protection as possible for their new permanent teeth. Primary teeth should be brushed by parents twice a day from the first tooth onwards. Parents should re-brush thoroughly after the child has brushed first. From the age of 6 years children have the ability to brush their teeth alone twice daily. However, parents must supervise the toothbrushing (until the age of 12) and check on the condition of the toothbrush. A worn toothbrush is also less effective at cleaning teeth. For more information about pediatric dentistry, contact our University Place dentist, Light Dental Studios of University Place today!